The International Public Sector Conference focuses on how public sector accountants globally could continue to lead the world in a fast-changing 21st century, held on 1-2 March 2018 in Singapore and organised by ACCA (the Association of Chartered Certified Accountants) with our strategic partner the Singapore Accountancy Commission. The conference focused on ‘The Digital Public Sector’ and welcomed approximately 400 public sector accountants from around the world gather to discuss issues including: Innovating the public sector in the digital age; Transparency and accountability in the public sector, including implementation of international standards and the role played by Supreme Audit Institutions; Talent strategies in the public sector; Better public financial management and capacity building; How the public sector engenders an entrepreneurial environment. The conference featured contributions from leading figures in the accounting-auditing-finance profession, including Karen Sanderson (executive director, Industry and Government Services at New South Wales Treasury- member of Consultative Advisory Group, the International Public Sector Accounting Standards Board- IPSASB); Keto Kayemba (Assistant Auditor General, Office of the Auditor General, Uganda- Deputy Chairman, IFAC Professional Accountancy Organizations Development Committee), Anthony Harbinson (Director of Safer Communities, Department of Justice, Ireland) and Mr Dang The Vinh (Deputy Auditor General, State Audit of Vietnam). 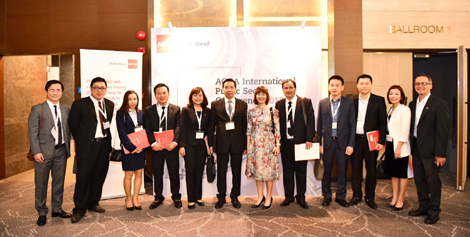 Vietnam was represented at the international forum by a delegation of 12 from the State Audit of Vietnam (SAV), the Ministry of Finance, Vietnam Association for Certified Public Accountant, Viettel Corporation and ACCA Vietnam. Vietnamese Deputy Auditor General Dang The Vinh, shared at the Public Audit Sector session of the conference about how SAV accelerate their reform using IT applications, databases and IT audit as well as their increasingly international role via chairing the Asia Organization of Supreme Audit Institutions (ASOSAI) during 2018-2021 term. There were also various courtesy side meetings at the Conference to exchange ideas on digital public sector approaches and the accounting-auditing-finance profession development among the Vietnamese delegates, ACCA UK- Asia Pacific leaders and experts around the globe.